In addition to its obvious importance to the university, the Drama Theatre has a far-reaching potential for community functions, as well. It is perfect for business and individual presentations, corporate meetings, and economic development forums, and can be used in conjunction with other areas within the center. The Drama Theatre has been designed as an intimate space, with comfortable seating arranged near the stage. The 344-seat theatre features stepped seating to maximize sight lines and is acoustically designed for spoken drama productions. 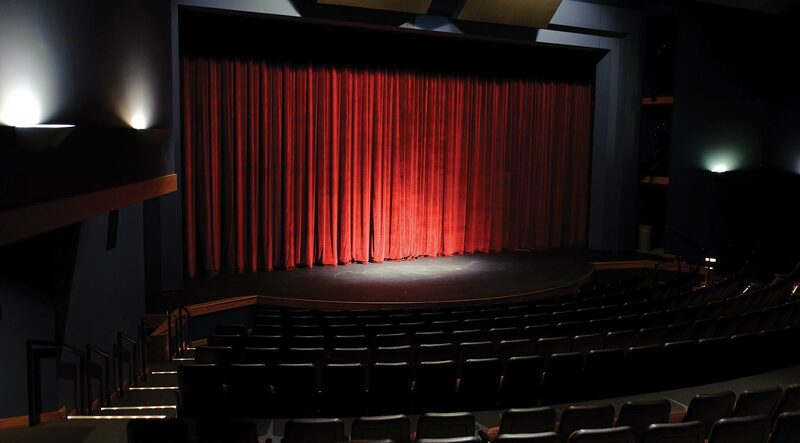 The proscenium features a 40’ x 20’ opening. The orchestra pit will hold up to 25 musicians. A stage apron can be placed over the orchestra pit to bring presenters to the front seats of the theatre. A complete catwalk system above the ceiling provides access for lighting and rigging areas. It also connects the backstage area to the control booth. The stage house features a suspended floor and full fly-loft, rigged so that scenic properties may be “flown” out of view. In addition, a massive doorway connects the state to the scenic design studio, so that properties may be easily and quickly moved between the spaces.